Have you carved your pumpkins? It's Halloween in 5 days. You better get to it if you haven't started! Not going to make you feel bad. We were also EXTREMELY late in getting our's done. Partially because I know when I say it's a 'we' project, it really is a 'ME' project, and I've been busy kids! But this year since we've gone a little baseball crazy in this house and the World Series happens to fall in NY on Halloween I decided we should show team spirit. So we carved one pumpkin New York Mets and the other Kansas City Royals. That was my little spark of creativity for the week! Nice change to our usual ghoul faces. Notice our Mets pumpkin is bigger? Purposely! They're in for the win and are going to bring it home for New York. I feel it! I'm also noticing the signs. 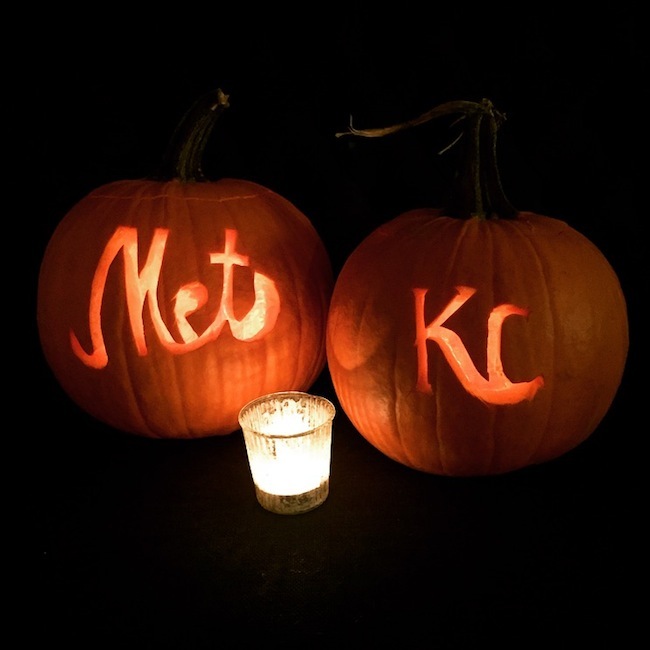 The candle in the Mets pumpkin keeps glowing bright, while the Royals pumpkin can't keep it's candle burning! Spooky? HA. Let's go Mets!! !